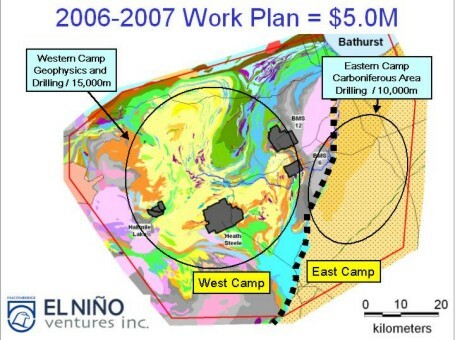 September 6, 2006, Vancouver, BC -- El Niño Ventures Inc. ("El Niño") (TSX.V: ELN; OTCBB: ELNOF; Frankfurt: E7Q) is pleased to announce that the Titan 24 ground geophysical survey and line cutting are continuing on the Bathurst/Zinc Base Metals Mining Camp as the company gets prepared to commence a 23,000 metres (over 75,000 feet) drill program in September 2006. The first of three drill rigs will be situated on pre-established targets; Mount Fronsac North, Camel Back, and the Key Anacon North Extension. The second rig will begin in October, and will be located on the Carboniferous targets in the eastern portion of the area. The third drill rig will be concentrating on the Titan 24 targets, identified along the Brunswick Horizon. Drilling will be continuous from mid-September 2006 through March 2007. El Niño Ventures Inc. is also pleased to announce that an option agreement was signed with Mr. Claude Willett and Mr. Lorenzo Noël of Bathurst, N.B. This agreement will allow Falconbridge Limited, a subsidiary of Xstrata plc and El Niño to earn 100% of property by paying a total of CDN $200,000.00 over 3 years. El Niño and Falconbridge Limited, a subsidiary of Xstrata plc, also staked another 115 claims throughout the summer. Thirty-six of those claims (Taylor Brook East) will cover the western extension of the favorable geology of the Heath Steele deposit. An additional 79 claims (Tozer Brook) was staked to cover the stratigraphy that occurs in the Tomogonops River area. A geoscientific compilation of the area has indicated that the Brunswick Horizon is repeated and may extend further south than previously thought. The Mega TEM airborne EM survey defined extensive conductivity throughout this area. Mr. Jean Luc Roy President of El Niño, states, "We are very happy to report to our valued shareholders that this major project is well underway and that a steady flow of information over the next months will be made available. We are moving our efforts forward to acquire advanced exploration projects in Alaska and Europe." El Niño is an exploration stage company currently developing an aggressive global acquisition strategy. Our business model is to revisit former mining regions, apply new technologies to advanced stage exploration targets, and aggressively acquire new projects. Our present focus is on Canada, Alaska, and Eastern / Central Europe. In Canada, El Niño has an Option/Joint Venture with Falconbridge Limited, a subsidiary of Xstrata plc, to explore the world class Bathurst Zinc / Base Metals Mining Camp in New Brunswick. El Niño is also exploring for uranium in the Bancroft uranium camp in Ontario. El Niño is currently negotiating on new projects in Alaska, and Eastern/Central Europe.